The holidays will be here before you know it! As I write this, there are just 2 weeks left to get something for everyone on your list. 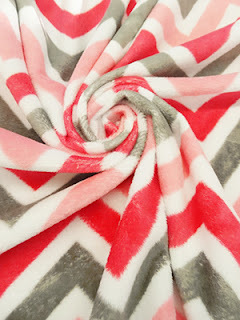 If you're looking for something for a special sewing friend or maybe you want to *hint* to someone what you would REALLY like, share these items with them. You never know, they could surprise you! 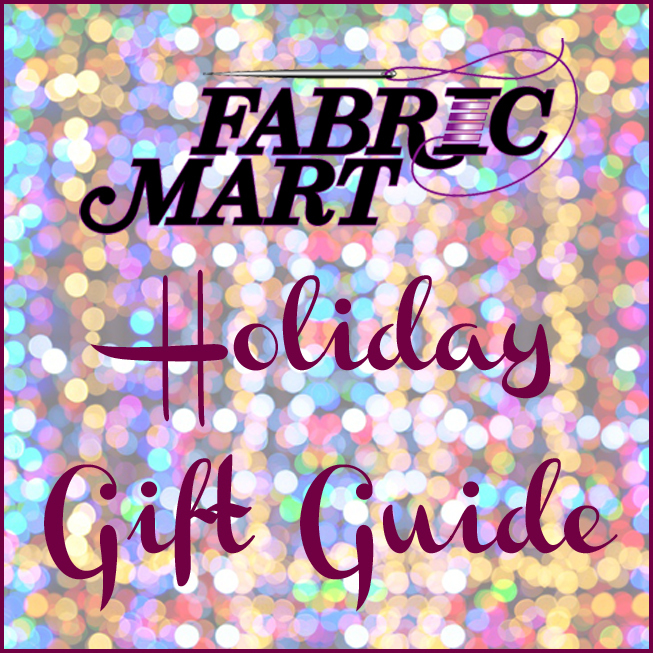 I've come up with a list of gifts you can get from Fabric Mart for the sewer in your life. I also added some fun sewing projects to the list that can be made with fabrics we carry. 1) Julie's Picks Swatch Club - This is club is a customer favorite. It's a great gift for a new sewer or seasoned seamstress. 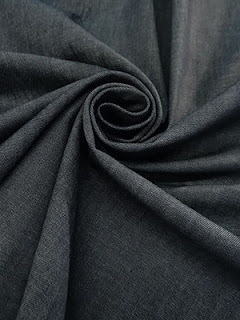 Many of our of new customers say that it is so helpful and allows them to understand more about fabric. 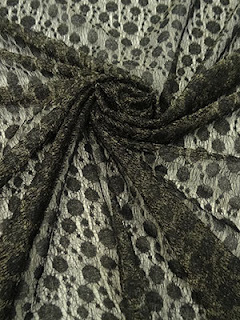 Seasoned seamstresses and newbies alike, also enjoy that you can feel the fabrics before buying them. Check out our new video all about Julie's Picks! 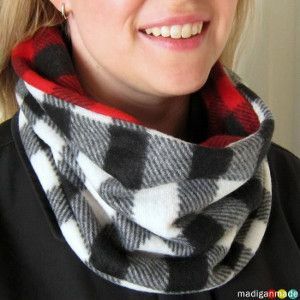 2) DIY Cowlneck Scarf - Cozy and soft, this cowlneck scarf can be made using fleece. 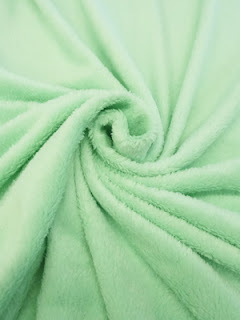 We have a variety of different fleece available - minky fleece, microfleece, polar fleece and more. See our selection HERE. 3) Educational Swatch Packet - This is the perfect stocking stuffer for a new sewer or experienced sewer that would like to learn a little more about fabric. Four different swatch packets are available -- Cotton, Knits, Silks and Wool/Suiting. 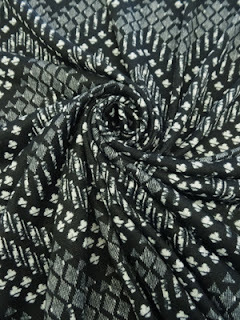 The swatches are large enough that you can feel the weight of the fabric pretty well and even sew on it. Different weights of fabric are included in each packet highlighting uses and care instructions as well. 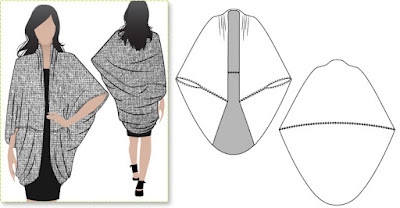 4) Quick and Easy Sweater Knit Shrug - DIY Ponchos and shrugs are popular gifts because they are quick & easy and look great when they are finished. Most pattern companies have some type of shrug or poncho in their catalog. I found a cool one from StyleArc - the Shirley Shrug. 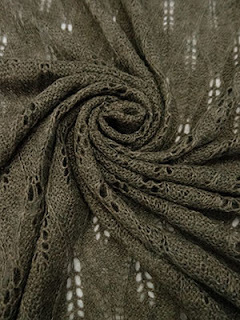 Use with a lightweight, drapey sweater knit. See our sweater knits HERE. 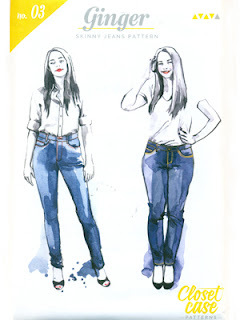 Everyone always wants to make a great fitting pair of jeans -- so try Closet Case Patterns Ginger Jeans and one of our stretch denims. Comfy and casual with a bit of lux. 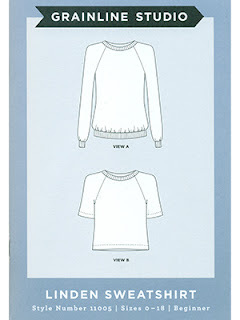 Our wool sweater knits (and other sweater knits too) are perfect for the Linden Sweatshirt from Grainline Studio. 6) Shirt Extender - I recently came across shirt extenders. This is a new fashion trend that I don't know how I missed it! If your shirts aren't quite long enough and you don't like wearing two shirts, a shirt extender is for you. To make ones like you see below, use any knit with lycra and some lace. 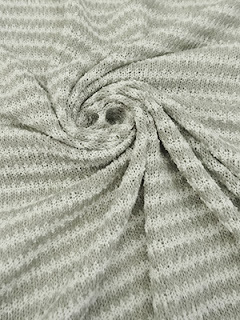 See our Knits HERE. 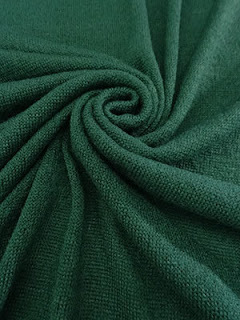 Look for basic knits such as rayon, nylon or activewear knits. 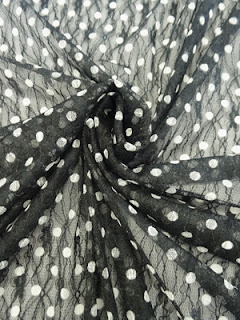 For the lace, find a basic black or white lace if you want to use it under multiple tops. 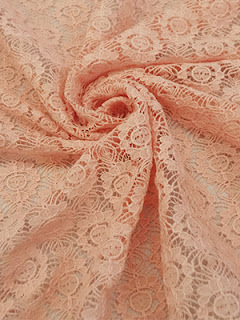 Or coordinate the lace with a top that you want to make it for. You can find our Laces HERE. You could also use mesh, which can be found HERE. 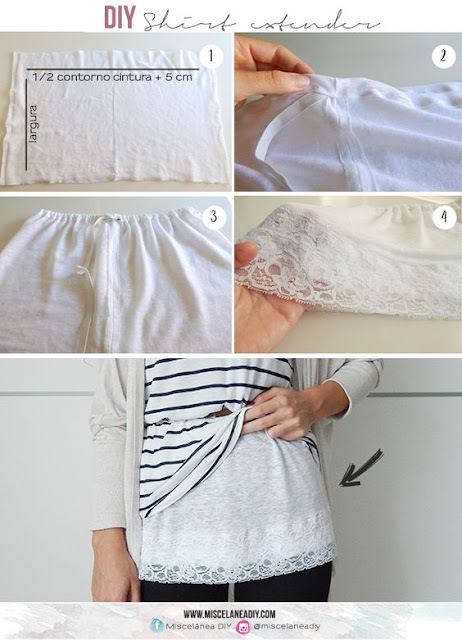 There are loads of tutorials on Pinterest, I found this one from Miscelanea DIY. It is in Spanish, but with the translator on your computer, or looking at the photos, I'm sure you can figure it out! 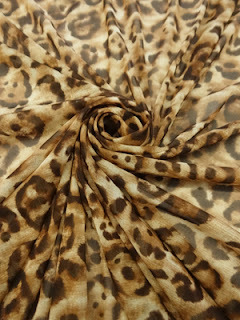 7) Sewing Patterns - If you would rather not pick fabric to go along with a pattern, buy a pattern pack. 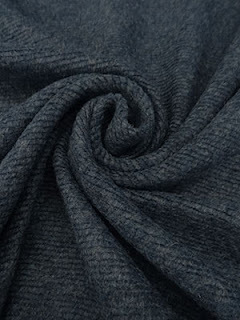 Pick 3-4 patterns from our hand-picked selection of patterns by Independent Pattern Companies. The great thing about these patterns are that all the sizes come in one envelope, so there's no guessing what their size may be. Check out our selection HERE. 8) Gift Certificate - Some people say that a gift certificate is a careless gift. Absolutely not! I actually would love a gift certificate. There are so many places I shop that I wish I had a gift certificate for, especially fabric stores!! They are available in any amount over $10. Buy one now! What a treat, now I have a clear plan for those last minute gifts. Thank-you. I just wish I knew other people who sew. This is a great list. What a great collection. I love the idea of the shirt extender!